This particular recipe/love-letter goes out to people of my ilk: you want to eat healthy but vegetables just aren’t your first choice. Not the politically correct thing for a clean eater to say, but the truth nonetheless. I tend to get my vegetable doses in quickly ingested gulps, thanks to my Vitamix. It’s the best way I know to down bunches of spinach, kale, tomatoes, a chunk of ginger, lettuce, or whatever else may be hanging out in my veggie drawer. I swear by the method, but a cold glass of vegetable juice isn’t always the most enticing option this time of year. So a few nights ago, the dinner hour was upon me and the sun was long gone. I wanted something warm and comforting and I also knew it was time to balance the eating scales with something vegetable based. Fortunately, I’d stashed a supply of Cauliflower Hash in the freezer. 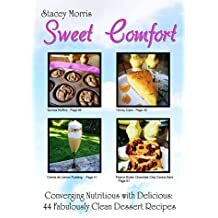 The recipe is from my cookbook-memoir Clean Comfort: An Adventure in Food, Courage, and Healing…How I Went From 345 Lbs. to a Size 8 Without Dieting, Surgery, or Losing My Sanity. Because of my policy to keep my pantry and refrigerator well-stocked, I had the other building blocks of a clean cream soup at my disposal: Coconut Coffee Creamer, and Truffle Oil…plus a little chicken stock to smooth out the texture. You can also use vegetable stock. Hands down the best way to replicate the best cream soup money can buy is a Vitamix. If you don’t have one, put it on your bucket list. They’re pricey but worth it. Nothing makes soups into velvety emulsions like this. QVC often offers payment plans and the Vitamix site offers reconditioned models at a fraction of the cost. If you’re using a food processor, just blend it as well as you can, using smaller batches so all the pieces can get properly chopped. I’ve been very open about not being a cauliflower fan. But cruciferous vegetables are some of the best for us, so I find ways to make it happen, hence the Cauliflower Hash recipe in my book. I love it because I have absolutely no cognizance I’m eating a cruciferous vegetable. This soup is absolutely off the charts. 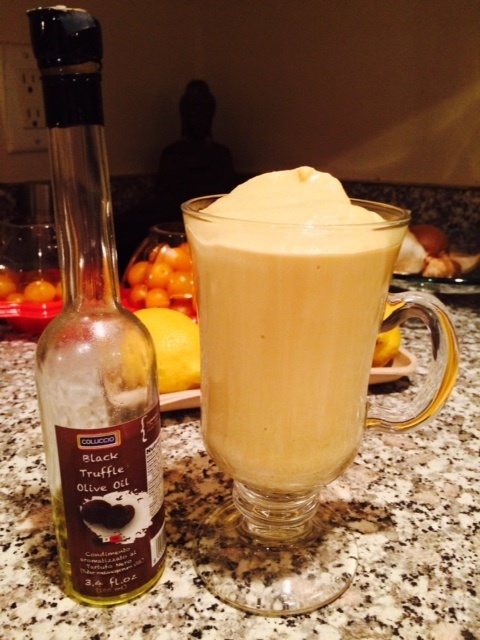 It came out almost like a mousse and has the most fabulously mild flavor, accented nicely by the truffle oil. If you don’t have truffle oil, just use a drizzle of extra virgin olive oil or a pat of butter. It’s divine! Extra creamer, unsweetened almond milk, or stock to thin consistency if too thick. Instructions: Place all ingredients in a Vitamix and blend until smooth and all the bits have been liquified, about 2-3 minutes. If using a food processor, place half the recipe in and do in batches till smooth. Place soup in a saucepan over medium low heat, stirring occasionally until thoroughly heated. Serve and drizzle with oil or garnish with a pat of butter. Guaranteed to chase away the winter blues! Mousse-like and delicious. Tastes decadent, but it’s NOT!